Ko Olina Beach Resort/Oceanfront (March 2-8) LAST MINUTE TRAVEL DEAL!! KO OLINA BEACH VILLA RESORT on LAGOON 2!!! Aloha! Please inquire about (packages including lais upon arrival, stocked refridgerator, wine/champaigne, luau and ocean activity tickets.) *Request additional photos of the Villa and Resort! Welcome to Beach Villas at Ko Olina. This elegant beachfront resort is located on Oahu's sunny western shore. This Luxury Suite is in a Premium location on lagoon 2. This two bedroom, 2 bath Villa is in a beautiful resort. A Lagoon away from the Marriott Ihilani. You will enjoy the beach villas & beautiful lagoons! Perfect for relaxing & enjoying with your family. The grounds are absolutely gorgeous as you can see. This villa is perfect for an extended stay & is furnished with HD Screens, DVD players & iPOD docking station. Kitchen created by Hawaii’s master chef Roy Yamaguchi, featuring the finest appliances from Sub Zero, Fisher-Paykel, Bosch & an open design. 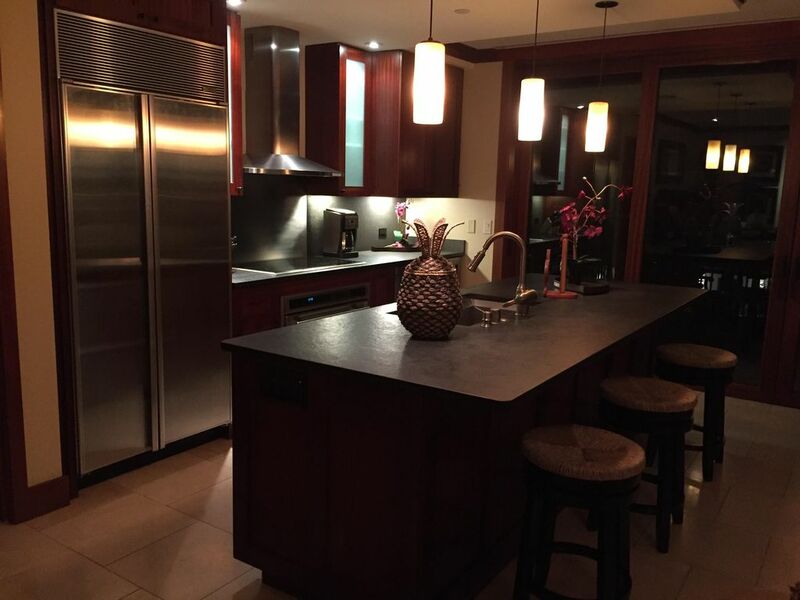 Fully equipped kitchen includes a Wine Cellar & more. This is a gorgeous area of Oahu for further details please contact us. Ko Olina is a gorgeous 5 Star Luxury Resort located on Lagoon 2. Next Door to the Aulani and soon to be Atlantis Property. This resort community is absolutely gorgeous and we look forward to having you! Aloha! Fully Equipped All Stainless Appliances with Sub Zero refrigerator. Stone flooring throughout. Brazilian wood. Cable with flat screens in both bedrooms and family room. Lagoon and Lap Pool one Resort Premises. The Beach Villa Condos and Ko Olina is the best place to stay when visiting Oahu! It is away from the hustle of Waikiki. And close to traveling around the island to sight see. The Beach Villa Condos are so much quitter then the other resorts surrounding. You really like you are ‘home’. The condo was great! We loved the layout with traveling with our kids. Very relaxing and beautiful property. Enough space to all spread out and relax. The condo was well maintained and beautiful! After reading other comments about the “display only” it was not any big of a deal at all! We are a family traveling with kids, I understand the owners wanting their condo furnishings to be kept in good care :) We cannot wait for our next vacation back to Oahu! Mahalo for a beautiful stay! One of the nicest places we have stayed. We will certainly be back next year! Thank you for the kind words. We look forward to having you back. Aloha! The condo was great, everything we needed. The kitchen was well stocked, we didn't miss anything...except maybe a kettle to boil water for tea, but a pot worked. Yes, it has a lot of "rules", but most of them are common sense rules that people should know and obviously the owners have had some issues that they think they need to put it all in writing. The grounds were beautiful and the area was great, away from hustle and bustle of Waikiki. All in all, it was a great place to spend a week. We'd definitely come back to this place if the opportunity arose. We really enjoyed our time at this unit, we have rented many other units as well, this was the first time we have come across notes on everything about "for display only" we laughed... one of the things it was on was a huge picture above the TV... we were pretty sure we would not be taking it off the wall and putting it in our suitcase... The unit had an awesome pool view. Our only compliant was the patio furniture was not in good condition and one of the chair legs was very rusted and will be breaking very soon. We would for sure stay in this unit again. Ko Olina is the most beautiful place on earth and the Beach Villas is a wonderful place to stay. he pools were amazing, we looked out to the quiet pool, in previous years the quiet pool wasn't so quiet but this year it was very quiet. I guess all in all I do have one more complaint... we wish we could own this unit instead of rent... loved it there, we will be back!!! We look forward to having you back. I wish I had known about the chair to have maintenance look at it. We replaced our patio furniture, as well. Until next time. Aloha! Ko Olina is a lovely spot to spend some time. The beach villa was very comfortable. The two bedroom two bath makes it easy to have others with you. We enjoyed the big outdoor spaces and felt the place was clean and well kept. The owner was quick to respond to any questions we had about the place. I would recommend it. It was our pleasure and we look forward to having you back anytime Cathy. Great location. Such a clean place, and everyone is so friendly. Loved it! February. This course offers challenging play and private instruction. against the best from the NFC. Fans, players and coaches vote to determine each conference's roster. The game has been held at Aloha Stadium in Honolulu, Hawaii, since 1980. Ideal for sunbathing, swimming and snorkeling.